South Suburban Savings: Amazon: Get the Cosco Umbrella Stroller for $19.95! Amazon: Get the Cosco Umbrella Stroller for $19.95! 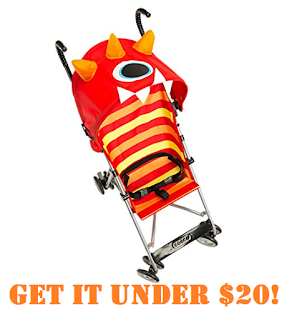 Amazon has the Cosco Umbrella Stroller (in Monster Elliot) for $19.95! The only assembly required is attaching the front wheels to the stroller. As always, you'll get FREE S&H on orders over $25 or if you have an Amazon Prime membership. For a limited time, you can get a 30 day FREE trial of Amazon Prime.